Kris Klabacha is the human face behind our America’s Got Talent star, Lola. 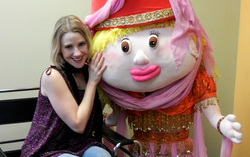 She’s also the voice behind several other Little People in many of our shows. THE BASICS: Ever since she can remember, Kris has been performing - whether it be in theater, musicals, choir, or making her own shows and videos for family and friends. After her high school lead role in Guys & Dolls, she chose to major in theater at Illinois Wesleyan University. Becoming a member of both Actor’s Equity Union and the Screen Actors Guild, she continued her passion for theater after college, both acting and working backstage at various venues. HERE’S WHERE IT GETS GOOD: In 1999, after a coworker told her about Those Funny Little People, Kris auditioned and had that “magical feeling” that began her journey as a Little Person. In her first nine months with us, she fell in love with the company! In 2000, she moved to Los Angeles to pursue her interest in film, where she spent a lot of time talking about the best job she ever had… working with Those Funny Little People! She spent eight years in LA taking acting and musical theater workshops, acting in student films, as well as studying creative writing and biology at the UCLA Extension Program. Most of her days were spent working as a legal assistant at MGM and, later, Disney. But, Kris realized she was not made for a desk job and, after leaving Disney (and Los Angeles), promised herself she would never work an “officey job” again. In the summer of 2009, Kris returned to her true love, Those Funny Little People! We Little People love her positive, fun-loving attitude and her wacky sense of humor. No one can accuse our loveable Kris of being dull! By the way fellas, did we mention that Kris, like Lola, is single? A committed employee, hard worker, talented performer and great person to top it off… we are thrilled to have Kris in the Little People family!